Priorities – what can you do when your boss WON’T set them? Who has the power to say no? And what can you do to help influence them NOT to say no? Don’t miss out – listen now! Tom: Have you ever had one of those really annoying customers who always seems to be looking to start an argument? Have you ever had a team member who just couldn’t let go and delegate work, but was always complaining about being buried? I’ve been there, and I know how frustrating that can feel. I also know these things don’t generally get better on their own. People need help learning exactly how to communicate, delegate, manage conflict with others, and plan more effectively. Now, you know it would be great if you had a simple plan to address those needs, but you’re crazy busy too, right? That’s why I created the Geek to Great 101 program. It’s a simple system designed for you to take a portion of your already scheduled team meetings to play a video for your team, ask a few questions from the Leader’s Guide, and your team members will be able to fill in their own personalized action plan. It’s a great way to put a simple professional development program in place. Your team members will be able to share their plan with you, and you can help them actually do it. Train your whole team for less than $500. Find out more information and get immediate access to your first free lesson at brighthillgroup.com/helpinggeeks. That’s https://brighthillgroup.com/helpinggeeks. Welcome to the Becoming a Geek Leader podcast, my name is Tom Cooper. 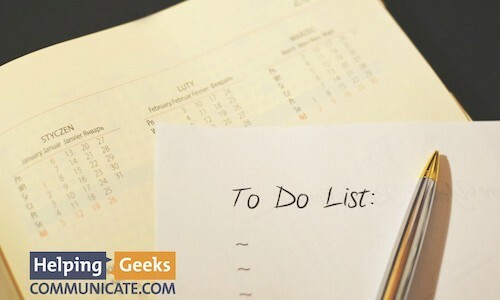 As a geek, I’m on a mission to figure out better ways to lead others at work and at home. Through the Becoming a Geek Leader podcast, I’m sharing what I’m learning, so I can help make you more effective at leading people too. Ready? I know I normally talk quickly, but today’s episode is really gonna be rapid fire. First, in the Thought Leader segment, I’ll be talking about how to prioritize when your boss won’t set any priorities because everything is a number one. In the Mailbox segment, we’re talking about customers who have terrible ideas. I mean what do you do? And finally we have a Family segment, and that’s all about figuring out who do you need to influence, and who has the power to say “no.” Let’s get started. Tom: In the Thought Leader segment today, I wanna tell you about my grandfather, George Kelly. He was a research chemist, and he had patents for all kinds of cool stuff. For a while, he worked for the Library of Congress, and one of his inventions was a way to chemically remove acid from book paper so that it would not yellow and fall apart. Not only that, but he could do it to a room full of books all at the same time without damaging the book. Now, that was cool. And one of the challenges pop had was that his boss refused to set priorities. So today’s thought leader is my grandfather, who taught me about priorities. Now, his boss would come to him with a list of 10 things, and he would expect pop to do them all at once. And I will tell you that anybody who knew my grandfather knew he was a right-brained, logical, step by step, methodical thinker who simply was unable to multitask. Now, you might imagine that this may have led to some conflict with his boss, and you’re exactly right. This skill we’re talking about today is one you’ll use throughout your career, and it starts at level one of the four levels of thinking as a geek leader. Tom: So let’s say you’re in a situation like pop, your boss simply won’t set priorities. He says, “They’re all important,” and “Get them all done.” Now, it’s ridiculous, but it does happen to far too many of us. So what do you do? Well, if your boss won’t set priorities, then you set the priorities. And what you need is a reason for your prioritization. Now, the crazy thing is that any reason at all will do, but I wanna challenge you to find great reasons to set your priorities. Now, the best way to do this is to align your work with your company’s goals, and you asking yourself, “How does my work tie to the strategic priorities of the company?” And what is it that your company really needs to get done? 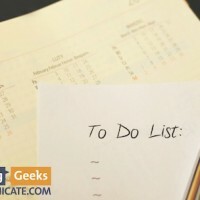 How does your to-do list link with the company’s strategy? Do you know what the company’s priorities are? Now, if you’re in a big company, check out your annual report. Look for ways your company is in the news. What are your senior leaders saying in public? Now, if you’re at a small company, think about the big rock challenges your customers are facing. How does your work link to solving your customers’ problems? Now, maybe you’re doing internal work that customers don’t see. For example, I worked in identity management, which was granting and revoking access to internal systems. Now, how was that important? Automating this improved security, it sped up gaining access to those critical systems, and it lowered our operational cost. That tied into a major goal of decreasing the operational overhead of corporate IT, which was really important to the business. Now, as you find the corporate goal, order your work in terms of the biggest payback to the lowest, based on the organizational goals. Now, some of you are gonna say, “Tom, I can’t even do that. Our leadership is so screwed up, they can’t even decide what’s important.” Now, if that’s the case, use your expert judgment to decide what needs to be done and when. Look at the list of projects, identify the resources required and the benefit to your boss, or at least the benefit to your team members, and based on your expert judgment, pick a list of priorities for your projects and publish it. When the boss asks why you’re working on number two and not number eight, say, “Boss, I get it. I want that done too, and here’s why I’m working on this one first.” For example, you might say, “This project is gonna take us three weeks, and it’s going to speed up our team’s efficiency for the rest of the year. Number eight will take more resources and more time, but you see once this one is done, we’ll have more available time for every project, including number eight.” You see where I’m going? So if he wants to reorganize the list, that’s okay, ask him for his reasoning for making the switch. See, lots of times bosses know things that we don’t know, and that might affect the appropriate priority. Now, if the boss doesn’t have a good reason for changing priorities, it’s okay to negotiate with him about that. And we’ll talk more about influencing your boss in a future episode, but for now, know that having a reason for your choices is a powerful influencer, and that when your boss is talking about why things should be in a specific order, it gives you more information to help set priorities when he won’t. And that’s today’s Thought Leader segment. Thanks, pop. Tom: In this segment, I’m gonna be talking about how do we convince our leaders or our customers that they have terrible ideas? I’ve got an email from Dave here, and Dave writes, “I’m stuck. We’re planning a major upgrade to our financial system. Now, this is a highly customized, commercial product, and the upgrade planning alone is gonna take months. And we’re gonna have to rebuild each customization and prove that all the new code works. We’re on a very tight timeline to get this done. The testing of the customizations will take months to complete, and we have a limited upgrade window because we’re in a regulated industry. Now, here’s my problem. I just learned that my internal customer has decided that we don’t need a dedicated test environment, and they wanna continue to develop customizations in the old version of the software until the day of the cutover to the new system. Not only that, but they can’t or won’t give us more time, more people, or more money. Help!” Dave, the first thing I have to ask you is this, is your resume up to date? No, I’m just kidding. I remember being in similar situations, and I can appreciate that the situation as you describe it is awful. Now, probably close to 100 years ago, there was another guy who was faced with a similar problem. Now, of course, it wasn’t with a financial system upgrade, but he was in a dispute with a hotel about contract terms. Dale Carnegie tells a story of how he had planned 20 lecture meetings at a hotel’s grand ballroom. He had worked with the hotel for previous contracts, and he’d scheduled these meetings, he confirmed that the room was gonna be available, but he didn’t have the completed contract in hand. Now, knowing that the room was available, he went ahead and printed tickets and the promotional materials, and he’d already been selling them when he got a letter from the hotel that said the hotel was gonna charge him three times what they previously had charged him. Now, he was stuck. All that stuff had already gone out, and it wasn’t like you could just send a new Twitter update to tell people things had changed. He then took a piece of hotel letterhead and he created the columns, advantages and disadvantages. Under advantages, he wrote the words “ballroom free”, and he said, “You will have the advantage of having the ballroom free to rent to dances and conventions. That is a big advantage, because events like that can pay far more than you can get for a series of lectures.” Under disadvantages, he went on to describe the fact that the income would certainly decrease from Carnegie, and all those business people who might have had a great experience in the hotel would not come to the hotel. And that advertising and promotion potentially leading to future business coming from the work that Carnegie was doing, well that would be lost as well. Now, he wrapped up with this, “I wish you’d consider these advantages and disadvantages before you make your final decision.” Now, interestingly, he received a letter from the hotel manager the next day, informing him that the rent increase was only 50%, not the originally noted 300%. And he did that without ever mentioning what Carnegie wanted. He spoke only in terms of what was important to the hotel manager. So Dave, getting back to you and your internal customer. I think you know their plan is a terrible one, and that moving forward with it is gonna lead to frustration and pain, and long work hours with a low likelihood of success. But they’re not focused on that. So let me ask you, what do they care about? So let me just give you a couple of ideas. For example, what would it mean to their team’s work, now this is the customer’s team, not yours, if they have to spend time debugging a live system which wasn’t able to be tested before it go live? What are the consequences of having the customizations not convert properly or not convert on time? In your you know regulated industry. is there a regulatory compliance problem if the financial system is delayed? What are the consequences of being out of compliance if something goes wrong? Finally, is there a revenue problem if they can’t have access to the financial system? You know I worked in enterprise B2C business, and if our retail sales website went down, we lost millions of dollars, even if we had a short outage. So I think you’re getting where I’m going with this. Just like that hotel manager, you have to find out what matters to them, and help them understand the advantages and disadvantages of their plan. Now, one final note when it comes to persuasion. Think about what Carnegie said as he left that meeting. He said, “I wish you’d consider these advantages and disadvantages before you make your final decision.” I’ve gotta tell you, this is actually brilliant, just one small sentence. None of us wants to be inconsistent with our previous decisions, even if our previous decision was a bad one. What Carnegie did here was he gave the manager an excuse. He opened the door for the manager to change his mind without having to say he changed his mind. After all, if the 300% rent increase was his final decision, well then he’d have to violate his internal consistency to make a change. But if the rent increase was merely an idea floated before he made his final decision, well then he could easily change his plan and not feel like he was compromising his previous decision. I’m telling you, this idea is a great one and it is very useful. So Dave, I hope that helps. And that’s today’s Coach’s Mailbox segment. Man: In the Family segment, Tom shares leadership lessons from his family life. Tom: In today’s Family segment, I wanna talk about the question, who has the power? Now, I have a story that’s ripped from the headlines, inspired, as they say, by actual events. Let’s say that you’re an IT leader in a Fortune 500 company. Hypothetically speaking, let’s say this is a large hotel company with the initials Marriott International. In our story, you’re the server engineering guy. You’ve been looking at vendors, needs and capabilities, and you believe the company should switch the hardware from a different manufacturer, rather than the current company standard. You’ve done your research, and from a cost and performance perspective this new vendor blows the existing vendor out of the water. It’s a slam dunk, right? So you make a list of who needs to approve the change, and you need to talk to your boss, maybe his boss, and the purchasing department. It should be pretty easy, right? Now, I’m gonna pause at this point in our story and jump back to Noah, my youngest. Now, as I have said, Noah is a master of influence. As the youngest child of seven, he falls at the bottom of the totem pole, and he’s gotta be creative in order to get what he wants. Now, I think he’s got a career ahead of him in sales or in some kind of opportunity that’s gonna involve influencing other people, because he has mastered the skills of influencing others. Now, he’s figured out that I am not the fun parent. It’s not that I’m anti-fun, but push comes to shove, he knows that generally mom is more likely to say “yes” to something fun. So he also is plainly aware that mom and I have a policy, we back each other up. If you get an answer you don’t like from one of us, you had better not go to the other one for a different answer. See, the kids know that mom and I talk to each other too, and we are gonna find out if you’ve played that game with us. So Noah knows that I have the authority to say “yes,” and more importantly he knows that if I say “no,” that is it. The answer is “no,” there’s no appealing to mom. In fact, he’s so fully aware of this, that even when he was younger he figured out if there’s something he wants that his best bet is not to ask me first, but to ask mom. In fact, he’s done it so often it’s become a running joke in the house, and what you’re about to hear happens with frequency. Yes, Noah? How can I help you? Noah: I would like to ask mom a question. Tom: Noah knows that I have the power to say “no,” and he’s very careful to use that idea to his advantage. Now, this is kind of a nuanced thing. You see, if he asks me and I say “no,” then he knows that the answer is gonna be “no.” But he also knows that if he asks mom and she says “yes,” that mom has influence over me. So if mom says “yes,” dad is gonna say “yes.” Pretty smart, huh? So let’s get back to you, the server engineering guy at the hypothetical hotel company. You look at the technical capability, and it is clear that vendor B is better than vendor A. You look at pricing, vendor B is lower price with at least equivalent quality, capacity to supply and to support the equipment. In fact, you’re already doing business with vendor B, it’s just a matter of making B the preferred provider. This is clearly the right decision, the plan should move ahead. Right? So you go to the person who has authority to approve your plan, the IT VP overseeing your area. And you present your case, and he shuts you down and hard. What? Why would he do this? He explains he understands your point of view and that your case has merit, but it’s simply out of his hands. He’s supportive in concept, but he does not have the power to make that change. Now, you’re baffled, you didn’t see this coming at all, you’re really upset. If this guy doesn’t have the authority, then who in the world does? It turns out it’s the sales department. The sales department? How can that possibly be? They don’t know anything about technology. Who do they think they are to make this kind of rule? I mean, that’s just stupid, right? Well, it turns out no matter how compelling your capability or cost savings are this idea is dead. Why? Because the preferred vendor, vendor A, has a huge sales force and consulting arm, and as it happens, vendor A agreed to make your hotel chain their number one preference for their employees in exchange for your company making them the preferred hardware vendor. And the sales that the hotel company gets from all those room nights far exceeds any cost savings you might have. So the business call is to use the lesser vendor’s hardware. And besides, nobody ever got fired for buying from vendor A, if you know what I mean. So in our story, the server guy had no idea there was a stakeholder with power and influence who could scuttle his plans. He knew who had the power to say “yes,” but it didn’t even occur to him that there was somebody who had the power to say “no.” And he didn’t even consider them in his examination of stakeholders, so they had the complete power to stop him. Like going back to Noah, he knows who can say “yes” and who can say “no,” and who has the influence. And he also knows if dad says “yes” that mom is gonna go along with dad’s plan. So here’s the practical application. When it comes to your projects and your goals, who has the power to say “yes?” And just thinking about what matters to them, and how do you make it easy for them to say “yes?” You know my kids will come to me and they’ll ask me, “Hey, dad, can I do X?” And one of the first questions I’m gonna ask him is, “Well, why would I say no?” Because it helps me to understand what are the negative consequences, right? So how can you make it easy for the person to say “yes?” And then, I want you to think about, who has the power to say “no?” What matters to them? Is there any way you can influence what matters to them? And that is today’s Family segment. Tom: In today’s episode, we talked about setting priorities when your boss won’t. How you can use your expert judgment to put your list together, and then use that as a starting point when you negotiate with your boss about priorities. We also talked about influencing others. Who’s got the power to say “no,” who can say “yes,” and what do you do if they have a plan that’s actually a terrible plan? Today’s hack is all about Dale Carnegie’s ideas with that hotel manager. Now, I want you to take two minutes, literally. Literally, just two minutes to pause now and I want you to think about the following questions. Number one, who is an influencer who’s standing in your way? Number two, what does that influencer care about? Think about, what are the advantages that matter to them and what are the disadvantages? Three, how can you present these advantages and disadvantages to those influencers in a way that helps them wanna think about doing things your way? And finally, how can you use Dale Carnegie’s technique before you make your final decision to help them reconsider previous decisions that they think are already finalized? And that’s today’s Episode Hack. If you like the podcast, can I ask you to give me a hand? It turns out it’s a big deal to have a rating in iTunes. Now, I’ve heard other podcasters asking for ratings and reviews, and I wondered why they kept going after it again and again, and again. Do you want to know? Because almost no one actually does it. It only takes a minute, and it’s a huge help. So why is that? Great ratings help iTunes decide that this podcast is worth promoting, and when you put a rating or a review, it helps it appear as a top podcast in the iTunes search. Could you please take a moment to do it right now? There are three simple steps. One, go to the iTunes Store, podcasts, two, search for “Becoming a Geek Leader,” and three, give the podcast a great rating. Thanks.